In the process of making art the mind wanders and gives way to instinct, which feeds off areas the intellect doesn’t. The process is one of distillation to the point where it’s just essence, just itself. Color spit bite and sugar lift aquatints with hard ground etching and drypoint. Image size: 45 x 20"; paper size: 54 x 28". Edition 30. Color spit bite and sugar lift aquatints with drypoint. Color spit bite and sugar lift aquatints with drypoint and soft ground etching. Set of 12 spit bite aquatints with drypoint, each printed in a different color, 10 on gampi paper chine collé. Image size: 11 x 17"; paper size: 20 x 15". Edition 10. Spit bite aquatint with drypoint printed in blue on gampi paper chine collé. Color spit bite aquatint with drypoint printed in brown on blue gampi paper chine collé. Spit bite aquatint with drypoint printed in graphite on blue gampi paper chine collé. Drypoint printed in red on gampi paper chine collé. Spit bite aquatint with drypoint printed in blue on yellow gampi paper chine collé. Spit bite aquatint with flat bite etching and drypoint printed in red. Spit bite aquatint with drypoint printed in purple on gampi paper chine collé. Chris Ofili was born in 1968 in Manchester, England and studied at London’s Chelsea School of Art from 1988 to 1991. He completed a Master’s degree in painting at the Royal College of Art in 1993. Ofili’s paintings refer to aspects of his Nigerian background and tackle themes of love, gender, religion, death and race. In recent works he blends spirituality, music, and folk art into his diverse subject matter. In 1997 Ofili was included in the controversial group exhibition Sensation: Young British Artists from the Saatchi Collection. This exhibition traveled to the Brooklyn Museum where Ofili’s painting, The Holy Virgin Mary, was the object of criticism by mayor Rudy Giuliani. Roberta Smith wrote in the New York Times, “These works mix art, craft and witchcraft, along with references to popular culture and non-Western traditions, into a kind of global vernacular. His paintings confound peaceful resolution by pitting the decorative against the political, the pure against the profane, the celebratory and humorous against the caustic and dark.” Throughout the ‘90’s Ofili showed widely, and was awarded the Turner Prize for painting in 1998. In 2002 Ofili’s exhibition titled The Upper Room at the Victoria Miro Gallery in London showed 13 dramatically lit portraits of rhesus monkeys with the central monkey assuming a Buddha-like pose, while the other 12 suggested the apostles. A year later, Ofili was selected to represent Britain at the 50th Venice Biennial. That installation, Within Reach, of lovers in a tropical paradise, celebrated a spirit of optimism. In 2005, Ofili left England and settled in Trinidad. That same year, a shift occurred with The Blue Rider, a solo exhibition at Berlin’s Contemporary Fine Arts. Subtle, almost monochromatic creations in black, dark blue and silver were “integral to his new direction as was the harmonizing of spirituality, music, high art and folk art,” wrote Remi Abbas in Portrait of the Artist in Motion for Spread Art Culture Magazine. In 2007 in his solo exhibition Devil’s Pie at David Zwirner in New York, Ofili moved into sculpture and replaced the decorative dots in his paintings with planes of matte color. In 2008 he was invited to Crown Point Press where he created 17 color etchings in a rainbow of colors. Ofili has shown widely and has been in group exhibitions in Tokyo, Berlin, Glasgow, Manchester, Harare, and Hamburg. His work is in the permanent collections of the Museum of Modern Art, New York; the Tate Gallery, London; the Museum of Contemporary Art, Los Angeles; the Carnegie Museum of Art, Pittsburgh; the Saatchi Collection, London; the Walker Art Center, Minneapolis; and the San Francisco Museum of Modern Art, among others. In 2017 he was made a Commander of the Most Excellent Order of the British Empire (CBE) at Buckingham Palace. Chris Ofili currently lives and works in Trinidad and is represented by David Zwirner, New York, and Victoria Miro, London. 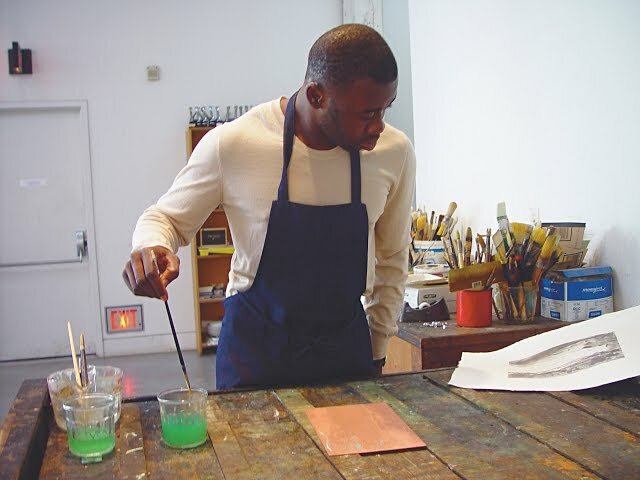 Artist Chris Ofili describes working at Crown Point Press in San Francisco, 2009.